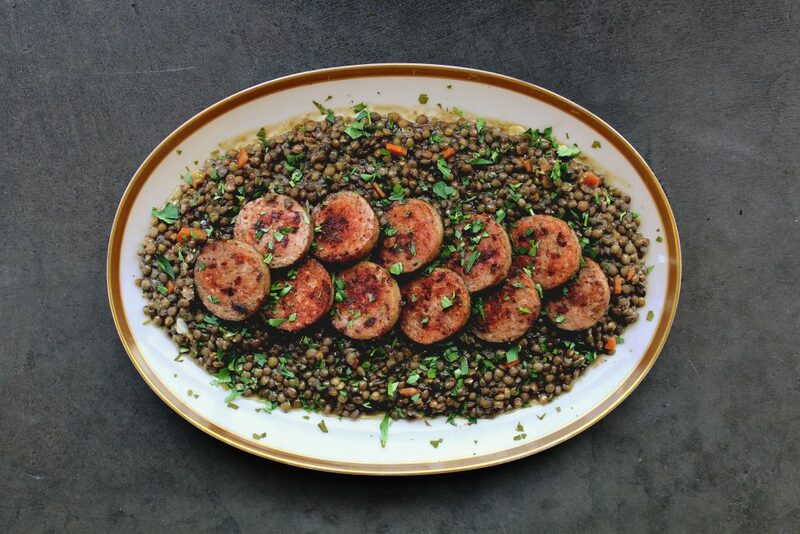 Probably one of my all-time favorite eating traditions involves gorging myself on super tender lentils that have been cooking with a juicy, flavor-packed sausage… FACT. 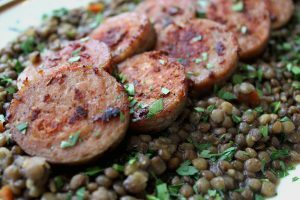 The tradition comes from the Emilian-Romagna region of Italy, where they believe that the more coin-shaped Cotechino and lentils you eat on New Year’s Day, the more luck and wealth you will have in your next year… PROBABLY FACT. I am a superstitious Greek man who cannot turn down the opportunity to get lucky and prosper… FACT. 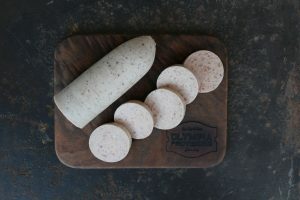 Cotechino is known for its unique texture (slightly “sticky” from skin) and big flavors (sweet cinnamon and spicy chili flake). I make it once a year, for luck, and this year I want to share it with all of you! After all, who can’t use a bit more luck in the coming year? Place a medium size pot with a tight fitting lid on your stove top on medium heat. Add the olive oil, onion, carrots, and celery. Cook for about 15 minutes stirring with a wooden spoon taking care not to burn them. You are looking for a really tender veg with minimal color. Add the lentils and give them a good stir. Add 2 quarts of the chicken stock and bring to a simmer stirring to ensure that you do not scorch the lentils to the bottom of the pan. Once the lentils have started to simmer add the bunch of thyme and a good pinch of salt. Place a lid on top of your pot and place it in your oven for one hour. At the hour point check your lentils. You are looking for a really tender lentil. NO CRUNCH AT ALL!! If they need a bit more time check that there is enough liquid. They should be “soupy” if they need more liquid add the remainder of the chicken stock. When you are happy with the texture of you perfectly tender lentils remove them from your oven and place them on a very low heat on your stove top. Add the sherry vinegar give it a good stir taste for salt then add the sliced sausages to the lentils. Place the lid on top and allow the sausages to heat through. About ten minutes. At this point you should take out the champagne that you so wisely did not finish from last night and pour a glass for yourself. Add the scallion to the lentils (not the champagne), and portion into 6 bowls. Remember that the more you eat the luckier you will be and how much we here at op appreciate you all.